We Transfer All Video, Audio and Photos - We Ship Anywhere! Transferring Your Memories Since 1988! 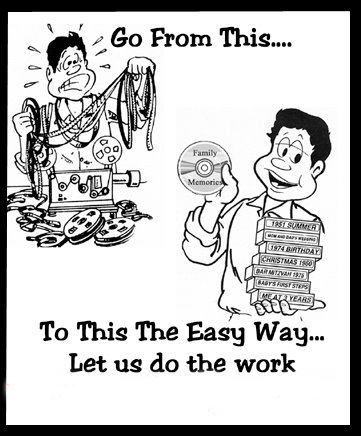 We can transfer all video formats. Restore, reprint and archive your pictures, negatives and slides. Cables, Cell Phone Accessories, Photo Cards, DVDs, Flash Drives & More! Protect your cherished memories with the help of our experts. We have the experience and equipment necessary to transfer all of your old photos and movies to higher quality, longer lasting formats for everlasting memories. All video, audio, photo and computer work done on premises! We have been transferring your memories since 1988! Professional quality video and electronic media work at a great price, and the owners are awesome people to boot! These guys (ladies) are awesome! I decided to transfer Mom’s old 8mm to a DVD about 5 days before her birthday. Normally a 3 week job, Transfer City USA did a rush job for me and I picked up my DVD about an hour before Mom’s party. They even edited and lighten any films that have faded or darkened over the years. It was a quality job – and a huge hit at the party!